The vintage style staggered pole single coil Rw/Rp version of our Five-Two Strat pickup uses a unique combination of alnico 2 and 5 rod magnets for sweet highs and tight lows. This vintage style single coil for Strat is designed to give you all of the dual magnet benefits that the standard wound Five-Two delivers, but is reverse wound reverse polarity so when combined with either the bridge or neck pickup in positions 2 & 4, it will be hum-canceling. Just like the standard wound version, the alnico 2 rods under the G, B, & E strings provide a sweetened treble response while the alnico 5s under the low E, A, & D strings keep them sounding clear and crisp. 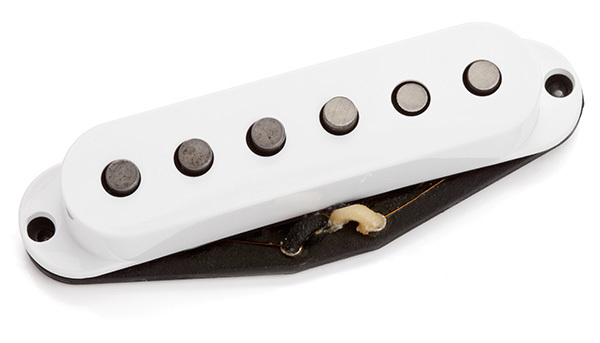 Combine with the Five-Two neck pickup and Five-Two custom bridge pickup for a complete setup. Like all of our vintage Fender style single coil pickups, we start with the right color and thickness of Forbon flatwork. Along with the period correct magnet stagger, this pickup comes complete with waxed and tinned cloth pushback hook-up wires and traditional keyed bottom plate. We hand file the flatwork, assemble, and lacquer the bobbin just as it was done during Fenders Golden Age. Includes 2 nickel plated round head Phillips mounting screws and 2 rubber surgical tubing height adjustment pieces.